Nowadays, automatic seismic facies analysis techniques have been growing as an important interpretation tool for the oil exploration industry. Depending on the reservoir knowledge, the seismic facies analysis could be supervised by a priori geological information, or could be unsupervised, when there are not enough data to guide the analysis. The unsupervised seismic facies analysis is usually applied in the preliminary phase, when the reservoir properties should be estimated almost exclusively with the seismic data. Even when, using supervised facies analysis, the a priori information is usually obtained through well logs data and its associated petrophysics analysis, which is always punctual compared to the large seismic volume density. Building and interpreting facies map. 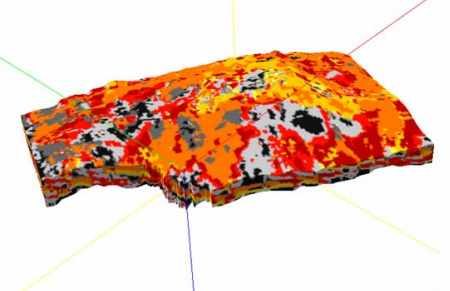 The main result of the automatic seismic facies analysis is the facies map, which represents, as a 2D surface, the properties of a volume region around a horizon or between two different surfaces. Despite the effectiveness of this methodology, it is very sensitive to interpretation errors (Matos et al. 2004), and it does not represents the vertical facies changes. One innovative way to avoid the interpretation errors is to use time-frequency techniques to locate and to characterize the stratigraphic surfaces, (Matos et al. 2003), (Matos et al. 2004). This work shows how to identify vertical facies changes through 3D voxel based unsupervised facies classification. Marcílio C. Matos, Instituto Militar de Engenharia, DEE, Rio de Janeiro; Paulo L.M. Osório, Pontifícia Universidade Católica, Signal Processing Lab, DEE, Rio de Janeiro; Paulo R.S. Johann, PETROBRAS S.A., Brazil.